While the FIT rate has dropped dramatically, the cost of installation has fallen even more. As a result, solar installations in the UK remain profitable, and competitively so. In fact, installers are better off now than they were in 2010, with a 41.3p/kWh FIT rate. In February of 2016, the FIT rate dropped some 65% for solar installers, with the locked-in rate changing from 12.47p per kilowatt hour to just 4.39p per kilowatt hour. The result was a shocking drop in installations, with 74% decrease in the rate of solar installations, for a total of 21 megawatts of small solar installed between February and March, in contrast to the 81MW installed during that time in 2015. But, while the government’s lack of budget for solar has affected buyer confidence, professionals in the industry are still recommending PV, and they have the numbers to back it up. 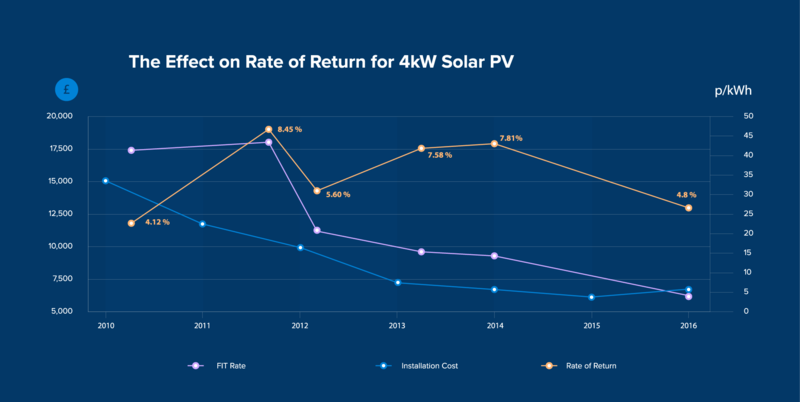 With recent changes to the cost of solar installation and the efficiency of panels, the return on solar is actually higher now than it was in 2010, when solar incentives were actually at their highest. How. 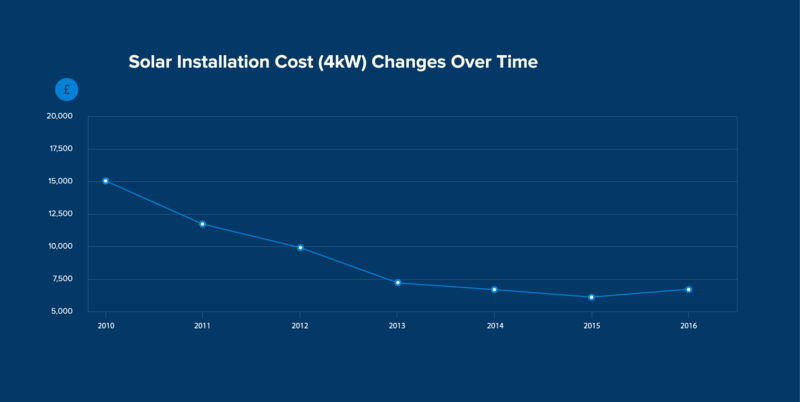 The cost of a solar installation has plummeted an average of 62% since 2010, while electric costs have gone up. Today, the average return for a domestic system is still 4.8%, comparable to ISA and other investments, making PV a smart investment choice. 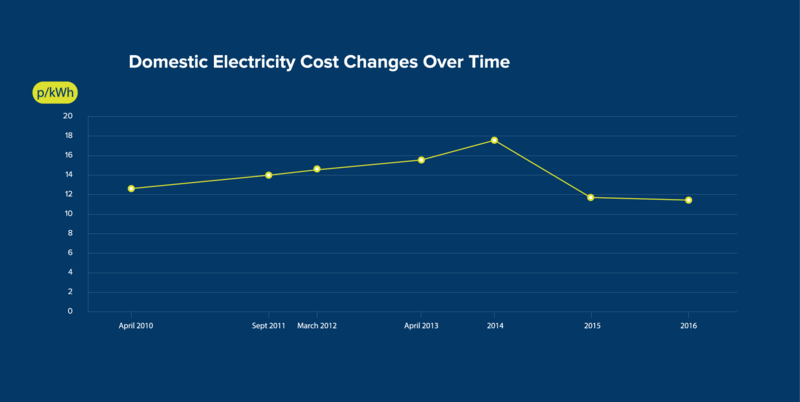 The cost of domestic electricity directly affects the return on solar, and prices tend to trend up. The current average is 11-12p per kwH, which has been the national average for over a decade, except for a brief peak in 2013, when costs reached nearly 16p per kwH. 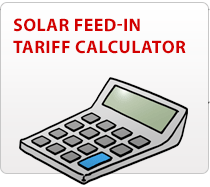 The current rate for return on a 4kw solar system is 4.8%, which is 3.01% lower than before the 65% drop in the FIT rate. This return still reflects positive earnings for homeowners, and is still higher than the 4.12% return expected by buyers in 2010. The FIT Rate has dropped considerably since it’s introduction, and the 65% drop in January/February is by no means the largest drop. In 2012, the rate fell from 41.3p/kWh to 21 and then 16p/kWh in August of 2012. 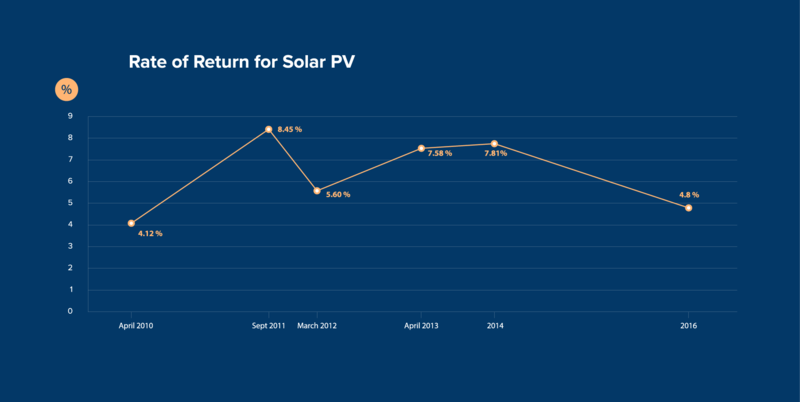 Despite the drop, solar was able to maintain a return of 5.60% thanks to falling installation costs. 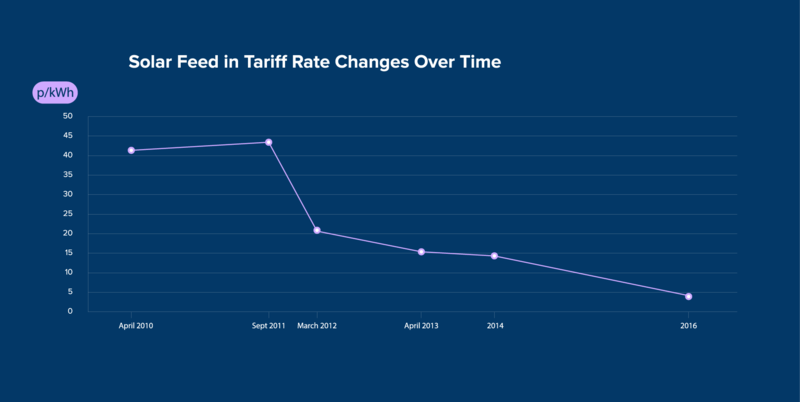 Solar panel costs have steadily dropped thanks to innovations in technology and better import rules. In 2010, the cost of installation was nearly £15,000 compared to today’s £6,000. That’s a more than 62% drop in just 6 years. Prices in 2016 will increase slightly due the VAT incentive being removed from equipment. All graphs contained in this post are released free under creative commons (CC BY-SA) with attribution to expertsure.com or the source page. This is an updated version for 2016 of this research by green business watch.